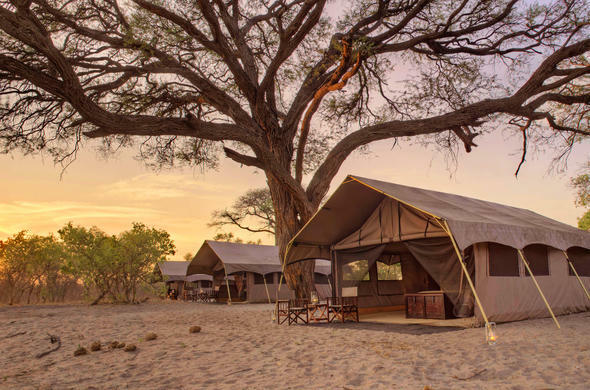 Enthusiastic safari-goers will enjoy a stay at the semi-mobile Savute Under Canvas camp. Boasting in its prime wildlife position in Savute, the camp spoils its guests with spectacular game viewing excursions. Chobe National Park in Botswana is one of the country's most appreciated parks. The Savute Channel in the southern part of the park is a region of flowing rivers and water bodies that attract a diversity of wildlife. Moving to a different site every 5 - 6 days, the lodge remains exciting and spontaneous. Unexpected game encounters keep game viewing excursions exhilarating. Game sightings on safari in Chobe National Park include lions, hyenas, elephant bulls, plains game and a prolific list of birdlife. Hunting in the Savute region is an exhilarating activity and the famous lions are known for constant attempts to hunt elephant, despite this being uncommon for lions. Game drives, safari walks and photographic safaris afford guests the opportunity to venture into the bush alongside trained guides and rangers. Meals are prepared by the staff and are consumed in the bush. Bush dining is a unique experience that can only be perfected in the African wilderness. A blazing campfire provides the setting for an evening under the stars sharing in the experiences. Children aged 12 years and older are welcome at the lodge. The lodge's WILDcild programme offers various activities to keep the children entertained.